Life in Germany has been hard since the end of World War I. Unemployment is rife and the German mark is almost worthless because of inflation. Many Germans are angry with the allies because of the harsh terms that they were forced to accept when the Treaty of Versailles was signed. Their country is falling apart and they need someone to save them. It is not surprising therefore that when a man comes along who promises to restore the Fatherland to its former glory, the German people welcome him with open arms. His name is Adolf Hitler. At first Helmuth thinks that Hitler and his regime will be good for Germany. His feelings do not last long however when he sees how the Nazis are treating the Jews. His grandfather, Opa, is worried that the Nazis are going to take away the basic freedoms that all Germans value. Surely he must be wrong Helmuth thinks. But, alas Opa is right and soon enough Germans learn that they must guard their tongues. Unless they want to be arrested by the Gestapo, they must never criticize Hitler and his policies. Over the years Helmuth grows into a young man. Though he hates what he sees going on around him, he keeps his head down and stays quiet. And then, one night in the spring of 1941, Helmuth decides to listen to the forbidden short wave radio that his brother brought home some time ago. He tunes the radio to the German broadcast of the BBC and he discovers something extraordinary. He comes to realize that his government has not just been keeping things from him and his fellow Germans, they have also been lying about almost every aspect of the war. Helmuth feels betrayed and he decides that he has to do something. He has to fight back. 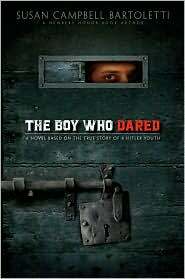 With great skill the author of this book tells the story of Helmuth Guddat Hubener, a real boy who did his part to fight back against a regime which he despised and hated. Helmuth paid the ultimate price and the tale shifts between his story from the 1930's and 1942, and a cell in the Plotzensee prison where Helmuth was imprisoned and later executed. Helmuth is waiting to die and he remembers his childhood, his friends, and his enemies. The shifts between the prison cell and Helmuth's past gives the story a feeling of immediacy which is very compelling and moving. Indeed it is hard to complete a reading of this book without feeling, at the very least, a lump in ones throat. The award winning author of this book has, in writing this book, created a stunning tribute to Helmuth and to all those people who dared to defy the Nazis.